The utilization of natural resources to satisfy worldwide growing consumption of goods and services has severe ecological consequences. Aside from the projected doubling of food consumption in the next fifty years, the growing trade of biofuels and other commodities is a global challenge as the economic activities in the primary sector (i.e. mining, fisheries, aquaculture, forestry and agriculture) can damage biodiversity and ecosystem services. This should be taken into account in the decision-making affecting the global value chains linking consumer, retailer, processor, and producer in the North and the South. To cover the topic of ecosystem services and global trade this book is organized into four major parts. Part 1 gives the theoretical framework from an ecological, economic and political perspectives. Part 2 explores how internationally traded biophysical commodities from agriculture, forestry and fisheries translates into a virtual flow of land, freshwater, and marine ecosystems. Part 3 describes how two widely used accounting tools (i.e., Life Cycle Assessment and Green National Accounts) deal with international aspects of ecosystem services, and Part 4 shows how instruments like labelling, bans, or payments for ecosystem services in the private and public sector can influence trade patterns and the management of ecosystem services. This collection is a valuable contribution to the global change science dealing with ecosystem services. It illustrates the consequences of international trade on global ecosystem services and provides an overview of accounting tools and of market-based policy instruments to address negative and positive externalities. The book is certainly innovative, because it brings together research findings from distinct disciplines especially Industrial Ecology and Ecosystem Sciences, as well as Environmental Economics and Political Science. 1. 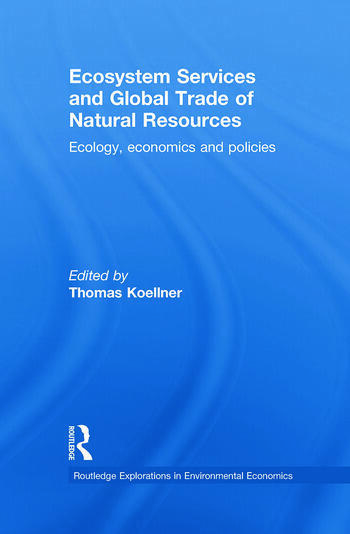 Ecosystem Services and Global Trade of Natural Resources: An Introduction Thomas Koellner Part 1: Foundations for Understanding the Trade of Natural Resources and its Implication for Ecosystem Services 2. Global Human Dependence on Ecosystem Services Jordan Levine and Kai M.A. Chan 3. Economics of Global Trade and Ecosystem Services David Zilberman 4. International Trade Policies and Ecosystem Services David Blandford 5. The Need for Global Governance of Ecosystem Services: a Human-Environment Systems Perspective on Biofuel Production Roland W. Scholz Part 2: Ecosystem impacts of global flows of virtual land, water and sea in the physical economy 6. Ecosystem Impacts of Virtual Land Use Embodied in Traded Goods and Services Thomas Koellner and Manel van der Sleen 7. Ecosystem Impacts of Virtual Water Embodied in Global Trade of Agricultural Products Hong Yang, Jungo Liu, Alexander J.B. Zehnder, and Johan Rockström 8. Global Trade of Fisheries Products-implications for marine ecosystems and their services Lisa Deutsch, Max Troell, Karin Limburg and Miriam Huitric Part 3: Accounting Tools for Global Ecosystem Services 9. Life Cycle Assessment and Ecosystem Services Thomas Koellner, Stephan Pfister and Annette Koehler 10. Ecosystem Services in Green National Accounting Jean-Louis Weber Part 4: Instruments for Global Governance of Ecosystem Services 11. Fair Trade, Environmental Labels, Bans and Ecosystem Services Ulrike Grote and Pradyot R Jena 12. International Payments for Ecosystem Services: Principles and Practices Graciela Chichilnisky 13. International Biodiversity Offsets Annah L. Peterson, Chloe Hill, Louise A. Gallagher 14. Landscape Labeling: Combining Certification with Ecosystem Service Conservation at Landscape Scales Jaboury Ghazoul Conclusion 15. Governance of Ecosystem Services in a World of Global Trade Thomas Koellner et al. Thomas Koellner is Professor of Ecological Services at the University of Bayreuth, Germany.